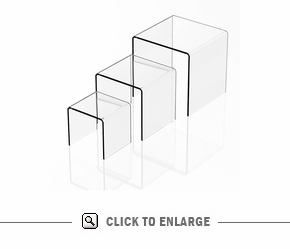 Set of 3 Acrylic Square Risers - Three Sizes- 3", 4", & 5"
Our set of 3 Acrylic Square Risers - Three Sizes - 3 in. 4 in & 5 in. Square help your products rise to full display potential. Made using cutting-edge acrylic fabrication techniques, these risers are simple display tools that occupy a minimum of space, and yet help your products get maximum customer attention. 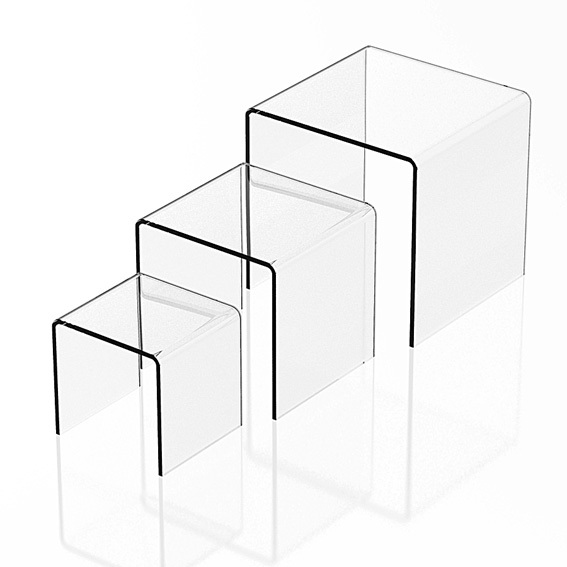 Constructed of 1/8" thick acrylic, these risers are perfect for lightweight items. You can choose from an array of square risers, variety risers and medium risers; from small to giant sizes depending upon your in store display requirements. We also provide innovative scroll risers that incorporate a design flair with curved edges. Beveled risers come with smooth beveled edges for a beautiful and aesthetic appearance. 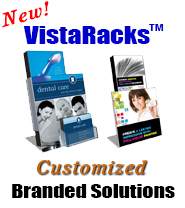 All these acrylic risers are inexpensive, durable and strong, and can easily bear the weight of your products. 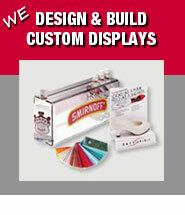 Combine with other Acrylic Displays and save on shipping!